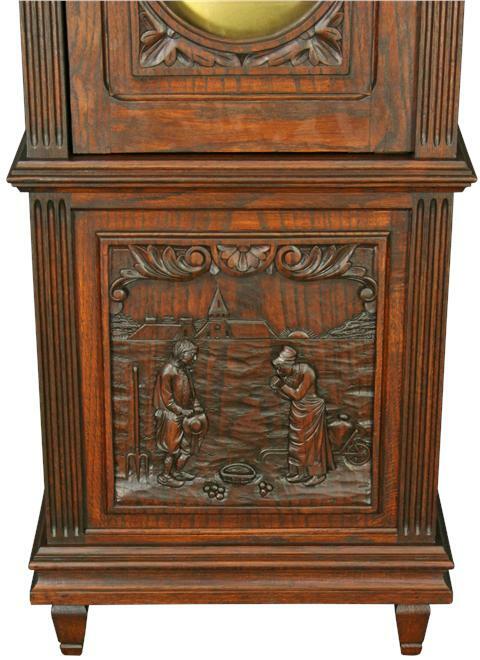 What is Brittany Style Antique Furniture? 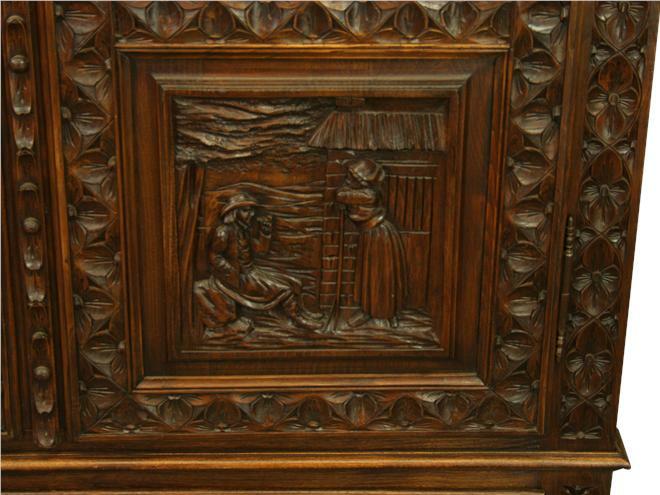 Do you like very heavily carved and dark antique furniture? Do you collect or admire Folk Art? Do you love Quimper pottery (the hand-painted style of ceramics from northwest France)? 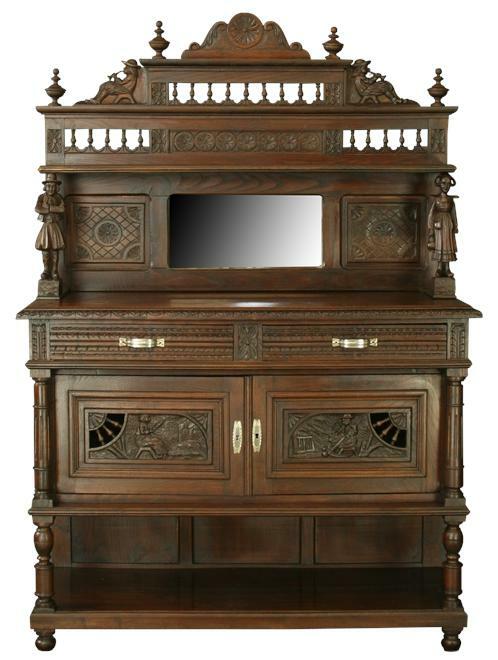 The Brittany Style of antique furniture is not for everyone, but chances are if you like ornate and elaborately hand-carved furniture and appreciate the rustic quality of Folk Art, you will love antique furniture in the Brittany Style. Located in the northwestern corner of France, the French province of Brittany, also known as Bretagne, was once an independent kingdom called Lesser Britain. Brittany is still recognized as one of the six Celtic nations in the world today, as the Celtic language, Breton, is still spoken there and many Celtic traditions still survive today. 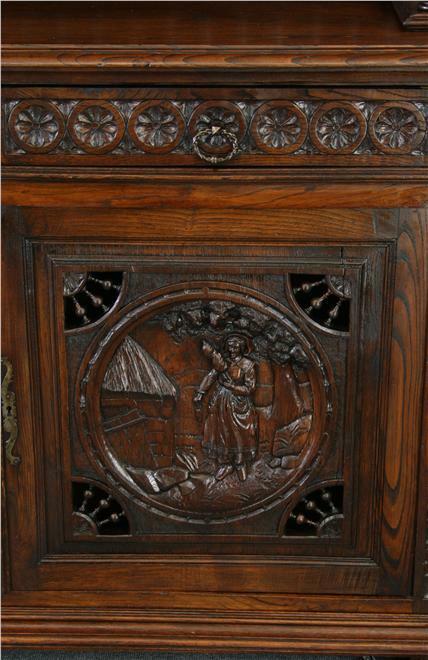 Drawing on the ornate and symbolic nature of Celtic Art, antique furniture produced in Brittany at the end of the 19th century was heavily carved and told a story through its symbolic carvings. 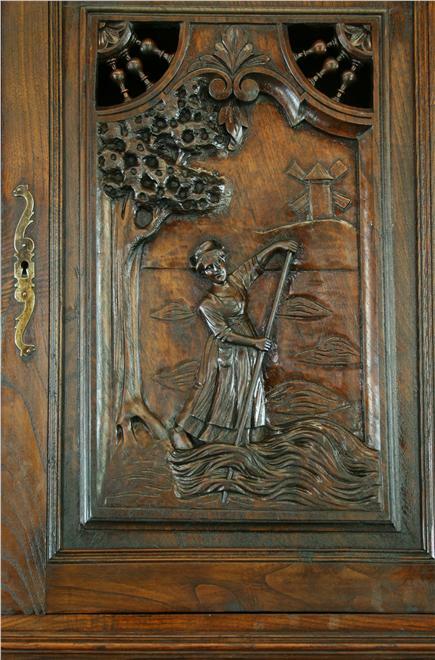 The rise in popularity of Brittany Style antique furniture can be attributed to a collection of Breton songs, known as The Ballads of Brittany, that was published in 1839 by Théodore Hersart de la Villemarqué. This collection was put together based on the centuries old oral tradition that had been handed down from generation to generation in Brittany and its intention was to preserve traditional folk tales, legends, and music. This collection of songs created new interest in the history of the Celtic tradition in Brittany and sparked a great demand throughout France for locally-produced, hand-made Brittany Style furniture. 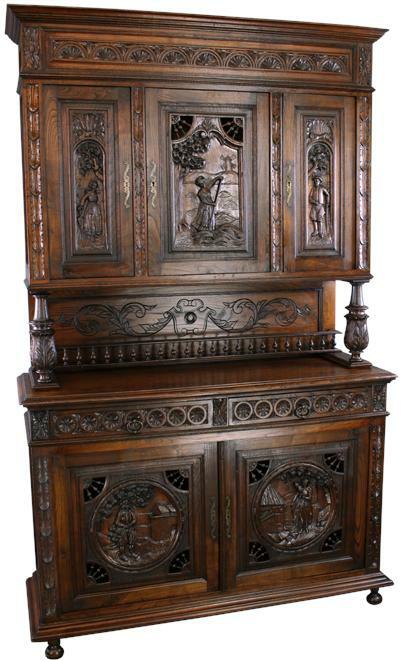 The Brittany Style of antique furniture is distinctive and easily recognizable due to its very ornate carvings. The local economy in Brittany was heavily dependent on fishing and maritime activities, so one often finds circles and ship’s wheels as a common decorative motif in the Brittany Style of antique furniture. 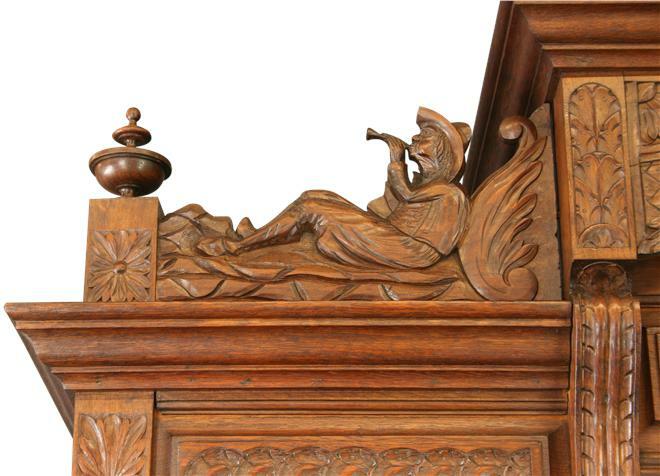 Most antique furniture in the Brittany Style was carved out of chestnut, a wood with a very dark finish. 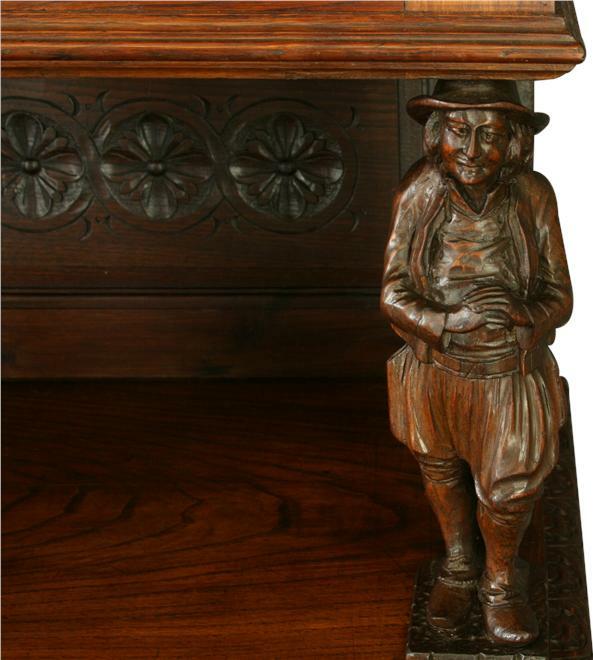 A hallmark feature of the Brittany Style of French Country Antique Furniture is the symbolic use of men and women in traditional Celtic dress to represent a strong work ethic, piety, and the enjoyment of life. The Brittany Style harkened back to the romantic ideal of a simpler time of days long gone. 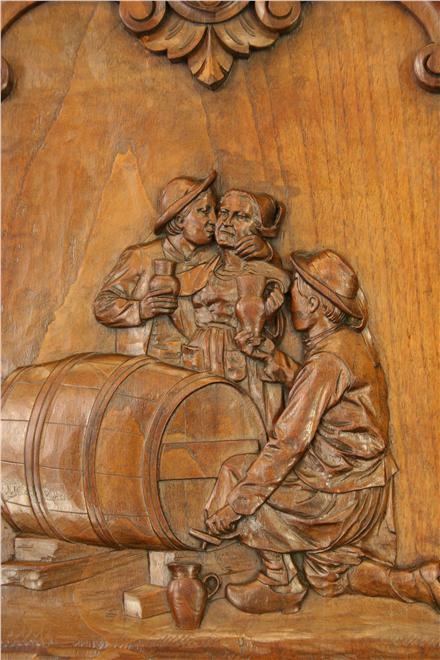 Even at the end of the 19th century, it seems our ancestors looked back fondly on the old days. 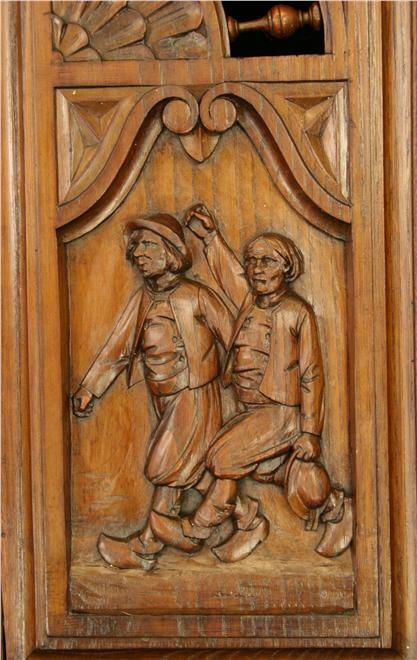 Antique Furniture in the Brittany Style, while expertly carved by hand, has a rather primitive or rustic nature to it, both in subject matter and style, that elicits the sense that it truly should be classified as Folk Art. I hope you’ve enjoyed learning about the distinctive French Country Brittany Style of antique furniture. 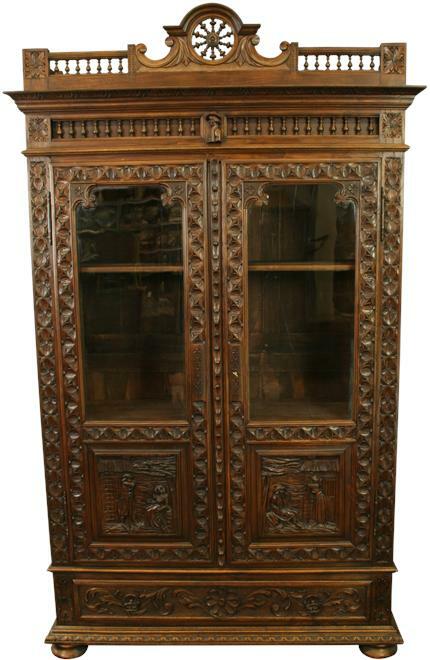 It is one of our favorites at EuroLux Antiques! Please let me know if I can answer any questions for you. 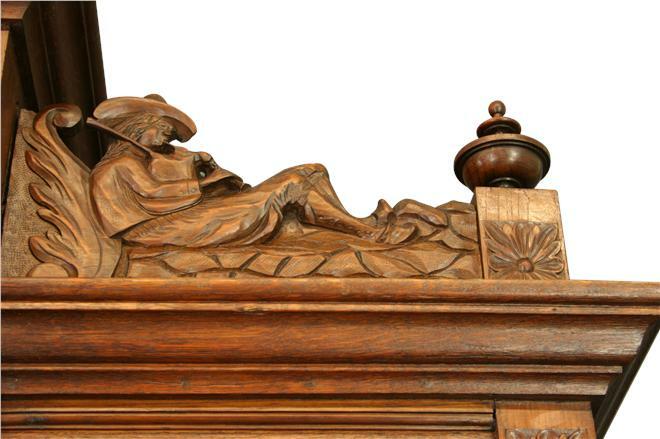 Thanks for stopping by the EuroLux Antiques’ Blog! 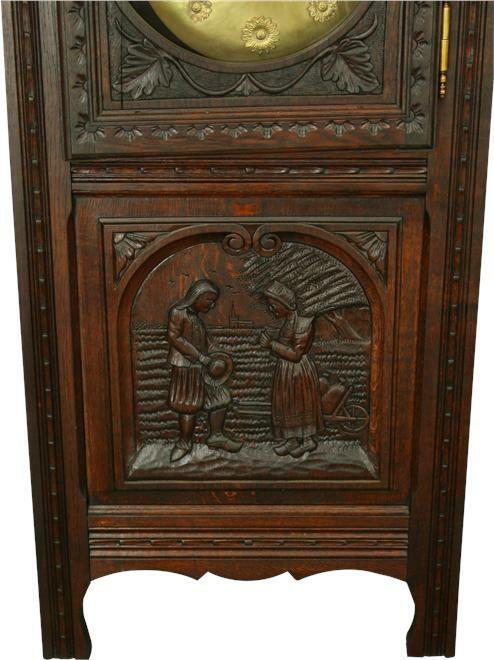 This entry was posted in Antique Furniture, Learn History & Styles and tagged Antique Furniture, Brittany Antique Furniture, Brittany Antiques, Brittany Style, Brittany Style Furniture, Celtic Furniture, Celtic Style, Folk Art, Folk Art Furniture, French Antique Furniture, Quimper Pottery on August 27, 2011 by euroluxantiques. I have a dining room suite from Brittany France circa 1900. If you would be interested I could email you some pictures. I need to sell it as I am moving and don’t have room for it.